With the ‘Blue Ticks’, which indicate the WhatsApp message has been read, creating a furore on the popular instant messaging service, the company is all set to roll out an update to make the feature optional. WhatsApp has released the version 2.11.444 which would allow the user to control the much feared blue ticks. Post the update, the user can select whether or not to send read receipts (blue ticks) to the sender. However, if you turn off your read receipts, you would not able to see the read receipts of other users as well. 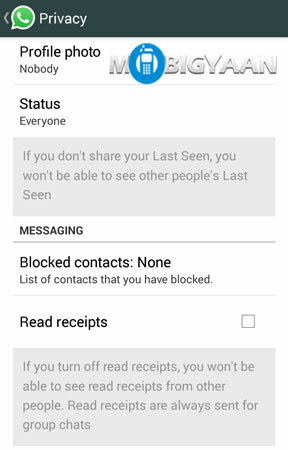 It would seem that all the major features of WhatsApp like the ‘Last seen’, the ‘Read receipts’ aka the blue ticks are features that the users force the company to make optional in an attempt to safeguard their privacy. As such most of these rather interesting features end up not being used. As of now, the update is yet to rollout on the Google Play store but you can directly download and install the latest version from the official WhatsApp website and heave a sigh of relief. Thanks Rohil for the very useful tip!